GMA Friday Freebie: 10 FREE Premium Business Cards! MOO is offering 10 FREE Business Cards! Start promoting yourself or you business with a new set of Business Cards. Business Cards make the perfect set of 'Mom Cards'. Choose from a range of beautiful MOO designs and add your (or your Mom's!) details to the reverse. No more scribbled phone number swaps at the school gates! Business Cards are also great for showing off your portfolio, your products or even your business. With the option of a different image on every card, upload your own artwork or choose from thousands of designs. Hurry! Offer expires Friday, June 21, 2013 at 11:59pm PST. One pack per person, per household. FREE Business Cards include Standard Shipping. Valid in the US only. We're sorry! This offer has now expired. Select a different image for every card. We call this technology 'Printfinity'. (Sample packs are printed with a 'MOO watermark'). Upload your logo or image for the reverse. Select a layout from the template library. Choose the 'MOO Original' paper or go eco friendly, with 100% recycled 'Green'. Every Business Card Sampler is delivered in a MOO-designed folder/ desk stand. Upload or Browse: Upload your own images/artwork or choose from our business card designs. Customize: Personalize with your details and choose your paper stock. 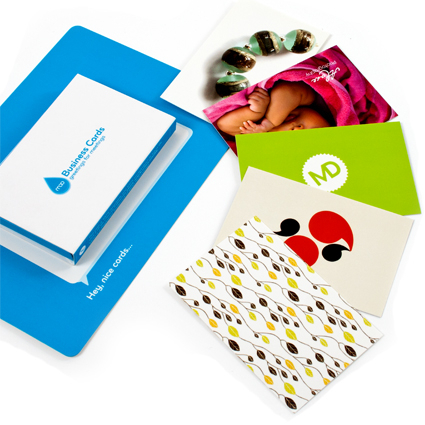 Purchase: We'll print, hand-pack and deliver your Business Cards to your door! A premium, 16pt, sustainably sourced paper stock, with a smooth matte laminate. A thick 16pt stock, 100% recycled from post consumer waste. Produced in factories powered by wind turbines, this premium paper is process chlorine and acid free. Find out more about our paper. It's often difficult to describe your work, so why not show it? Photographer, Simon Warren, prints a range of photos on MOO Business Cards. When he meets new contacts he's able to talk them through his work right there, and leave a card with them as the perfect reminder. Take advantage of Printfinity and create Business Cards featuring your products, like doughdough.com. Use the cards as a conversation starter, show people your product range and let them pick a favourite card to keep.